Hey all… thought it was long past due for a public, and “up to date” list of brands and abbreviations. This list is primarily to help DECODE the current state of things (not to reinforce the acronyms in current use)!!! 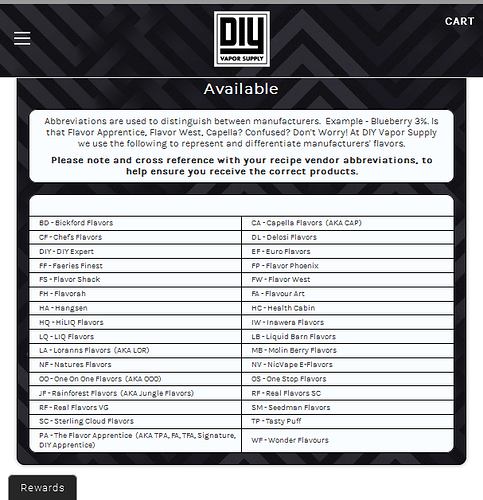 This is NOT just for flavor manufacturers (as much as I wish it was), but it includes those who relabel, rebrand, and resell (vendors) too. It’s a lengthy list, and whlie some are obsolete, there still exists the need to retain them (either for posterity, or because folks might still have some that haven’t gone bad yet). I’ve spoken to Daath (or at least left a PM) with a reminder for the need to consider/implement a “locking” feature for flavors that have been “retired” or even reformulated. But that of course is as he has time! Some of these overlap, and has led to understandable confusion amongst both newbies and veterans alike. But if “we’re” (cumulatively speaking) not AWARE of the overlap, then we can’t fix, nor prevent it before it happens!! Fortunately, it seems that the “trend” has been to spell out more and more, so that’s helping to keep things from going into “previously known” but what would otherwise be the incorrect abbreviation (iEG: if CV was previously alone, and was understood to be used for Chef’s Vapours -before the renaming of the company, and some other comes along and has a brand of Central Vapors. Then it’s understandable that a newbie might put his CV [from Central] into the CV [that used to be Chef’s]). So now, take that, and get more “convoluted” entries, when Chef’s Vapours becomes Chef’s Flavours, and VOILA! You now have TWO categories for a single company. CF and CV. (Sorry Chef’s -I’m really not trying to pick on you guys! But it was the first that came to mind, and serves as a great example! check ELR’s abbreviation list FIRST PLEASE!! FW - Flavour World S.A.
HTP - Hit The Pipe! (also seen as LAN, Laurens, Loraine, LA Oils: though for NON oil flavors. Please DO NOT include Oils because it’s in the company name. This is how we distuingish that the flavor contains OIL, which is NOT safe for vaping. They’re sometimes listed because some accidentally buy the wrong product!) We know they’re LorAnn Oils. SC - (used to be reserved for China alone, but this is changing due to other Chinese suppliers coming on board) Also, SEE DIYVS NOTE BELOW!! (incorrectly seen as FA, appr, prent, perf, and also Signature by ECX) While we use TPA, I’m lobbying for a change in that to TFA as that’s how they’re marketed and sold by the majority of vendors!! As well as the fact that they’re two separate companies! White chocolate base vta/white chocolate vt the same? Vendors using a unique labeling structure. Chefs have previously said that the Rebranded range are sourced from several different producers, some of which aren’t available as retail products. Capella has come out with a RF version (not Real Flavors), but Reduced Flashpoint. TFA has done similar, but uses the NF (understood to mean Non Flammable), but they actually describe them as “Less Flammable” (probably for legal reasons). It DOES NOT mean that it’s a Natural Flavor. 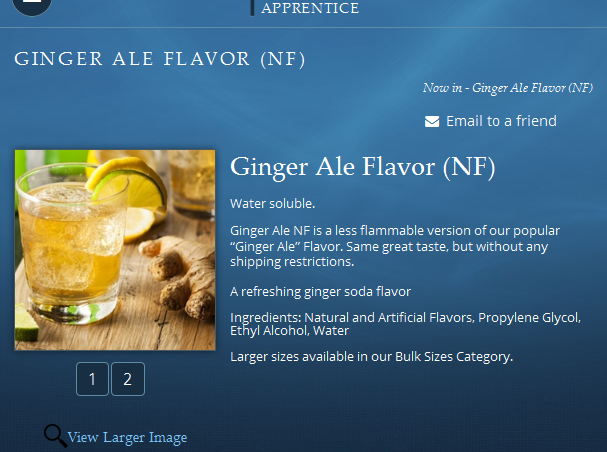 So please don’t enter Ginger Ale, Natural (TPA). As it doesn’t exist. I really like the 3 Initials max, and fully support the change from TPA to TFA. I prefer INW for Inawera, not the current INA. Great job, nice to see it is really moving forward. Personally i dont think it is important if things will end up as being INA or INW and so forth, as long as there will be a proper standard, then we just have to get through the transition towards changes. This is a very common issue with my nick, too many think it is a L.
I dont point it out hoping you will edit it, your time is better used elsewhere, just pointed it out. Sorry about that! But appreciate the clarification! Waawahwahwow! Thanks for the hard works! Great work, man! …you got sump’n against Nature’s Flavors (NF)? Alien Vapor --Area 51 flavors Florida, U.S.A.
Arte Italiano Flavour ? just bulk FA re bottled? I have ~ 23 other letters. Can PM them. Edit the above post and share away man! You also have a couple others I’ve forgotten just in the A’s lol. Yes from what I’ve gathered. Thks again for this and the work cleaning/attempting the DB. It has always been a thought of mine that if decent list existed, few would make mistakes. Christ,… now I have to update the italian version of the list on our forum…. I won’t say thank you…. @woftam already mentioned Jungle Flavors and Juice Factory but the above are also causing confusion.